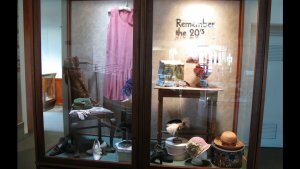 The Humboldt Museum's collection from the 20s features stylish shoes and hats, hat boxes, gloves and even a flapper dress! There's also a jewelry box, jewelry and a beautiful Tiffany lamp. This exhibit case was donated to the Humboldt Museum by Grace Duvivier in memory of her family, husband Jack Duvivier, brother Benjamin Etchart and daughter Blanche Duvivier.